Table computers like the Merel mTouch and the Samsung SUR40 running Microsoft's Surface software (nee PlayTable nee Project Milan nee Microsoft Table) have been a thing for a while now. The basic idea is very simple, just the iPad writ large--a giant, HD-quality, touch-sensitive screen, backed by a reasonably powerful PC. But hardware like that will set you back four or eight grand, respectively, putting it out of reach of all but the most dedicated hobbyists and institutions, and so table computers have consequently seen little uptake. A device like that makes a nice CES demo, and there are lots of cool /ideas/ swirling around it, but at that price point basically nobody can afford to use it, so nobody is really sure what it's worthwhile to /do/ with it. The Playsurface Kickstarter aims to change that. It's an open-source, open-hardware touch table that can be used as a peripheral for an external computer or with an integrated computer as a table computer. In order to get high enough screen resolution at a reasonable cost, the Platsurface team is using an extremely short-throw projector (rather than the expensive high-resolution active displays that the Merel and Samsung devices appear to be using). Unfortunately, this means that existing but expensive multitouch input hardware won't work with the new display. 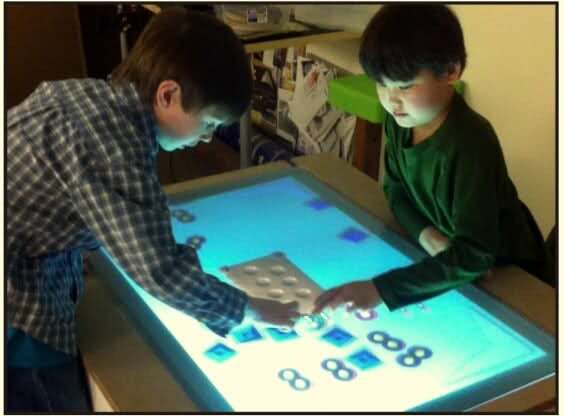 As a result, making the touch table work as a peripheral will entail designing a board, called the Blob Board, to make it available over USB like a mouse or Wacom tablet or an existing multitouch screen. This will allow software developers to all write to the standard USB interface rather than needing to each roll their own drivers for the touch table. The Playsurface is being developed by Templeman Automation, an engineering consultancy from Somerville, Massachusetts, who have done previous work on touch tables for the US Navy and the National Science Foundation, in the latter case together with Tufts University, so they have experience and reputation in this area to build on. The team also pledges that half of the money (at least the lower-level pledges?) will be spent on "getting the prototype hardware out in an educational environment," maybe one much like the Tufts project, so even if you don't want one of the devices yourself, your money will go towards productive uses. Even the lower pledge levels will get you early access to the mechanical and electronic designs for the table, which is a neat way to engage hobbyists who might want to build peripheral devices. A company like Apple might only extend that kind of privilege to a select group of partners, but in the open-hardware world, anyone is a potential integrator. If the Playsurface Kickstarter can reduce the price as far as it promises to, hopefully we'll start to see a lot more of them.